DREAMING OF BEING A HOBBY FARMER? Here is your opportunity for a lifestyle to be enjoyed - the quality of life for an individual, for a couple or for a family. 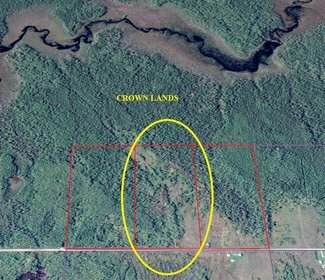 A real nice 33 acre property with year round access. This property has about a little over 15 acres in hay field. The rest of the property is in wooded lands with mostly Spruce trees. It would appear that the trees are about 30-50 feet tall and may be marketable in another 5 to 10 years. Located in Idington Township which is within the Municpal boundary of the Municipality of Opasatika in beautiful Northern Ontario. Idington Township is AN ORGANIZED TOWNSHIP. The property enjoys 266 meters or 872 feet of frontage on Lambert Road. Lambert Road is a YEAR ROUND ROAD that is maintained and plowed in winter by the Municipality. A current survey of the property was done in the middle of October 2017 and the survey bars on the corners of the property are well market with pickets and orange flagging tape. There are no buildings on this property. 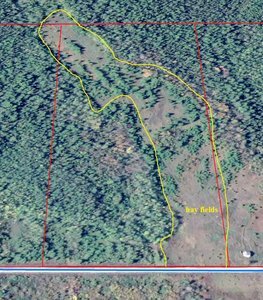 Electrical power ends on the property immediately to the north of this property at the old cabin. So, depending on where you want to build you can be as close as 40 meters to the last hydro pole or as far as 160 meters from the last pole. All in all this is very close to electrical power OR you may decide to go green and stay off the grid. We have talked to a well and septic company in the area and they state that there is plenty of water for someone to get a well drilled or dug and no problem to putting in a septic field. Opasatika (pronounced locally as Opa-set-ticka). Opasatika is a township in the province of Ontario, more specifically located NORTHERN ONTARIO in the Cochrane District on the Opasatika River. Opasatika is a friendly, beautiful town on Highway 11 with all the benefits of a full service community. 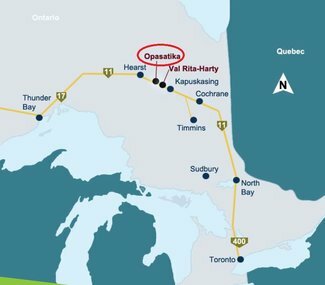 Opasatika is situated on Highway 11 between the larger centres of Hearst and Kapuskasing within the District of Cochrane in North-eastern Ontario. 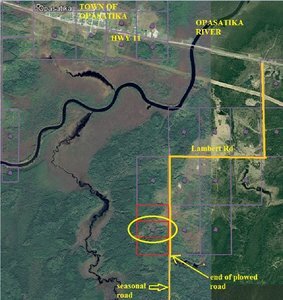 Opasatika is located about 33 kilometers (about 20 minutes) west of Kapuskasing, Ontario and 58 kilometers (about 40 minutes) east of Hearst, Ontario. The City of Timmins is just a two and a half hour drive away from Opasatika.. The Township of Opasatika offers a "Sensational" outdoor lifestyle such as fishing and hunting and access to education, medical services, recreation, shopping, leisure activities and other services in the nearby community of Kapuskasing. The Opasatika River is a paradise to fishermen and hunters. The scenic river flows approximately 29 kilometres North from the Opasatika bridge on Highway 11 into Allen Lake, situated in Neillee Township. A few kilometres on the South side of the bridge, you will find two important marshes named ‘La Marche du Village’ and ‘La Marche de Lambert’. Further South from the marshes is a beautiful waterfall named Christopher which flows into Rufus Lake. This lake is a prime location for fishing, hunting and camping trips. Rufus Lake is located 60 kilometres south of Highway 11. Coming from the east towards Opasatika from Kapuskasing. About 1 kilometer before the bridge over the Opasatika River turn left (south) onto Lambert Road. Drive down Lambert Road for 4 kilometers (2 1/2 miles). 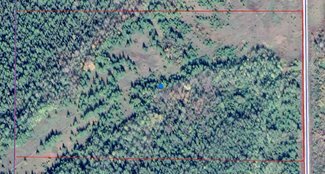 This is the property after you pass the old cabin. The property is on the right hand side (west side). The property continues for 266 meters or 872 feet.